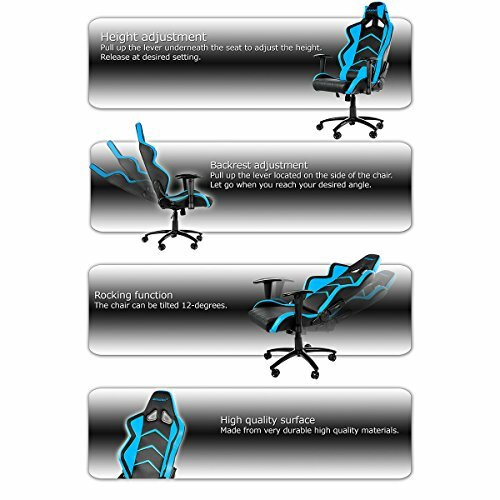 Whether you are an intense gamer that commits several hours per night to gaming or a casual gamer that plays a couple hours per week, the chair that you sit in can make a difference in your game play. I myself tend to be a weekend gamer, but I still need a chair that will remain comfortable for several hours of play. I also work from home, so I like a gaming chair that doubles as a computer desk chair for when I want to work from my desktop. I will review the AKRacing Player gaming chair in several key categories, including its appearance, level of comfort, and included features. 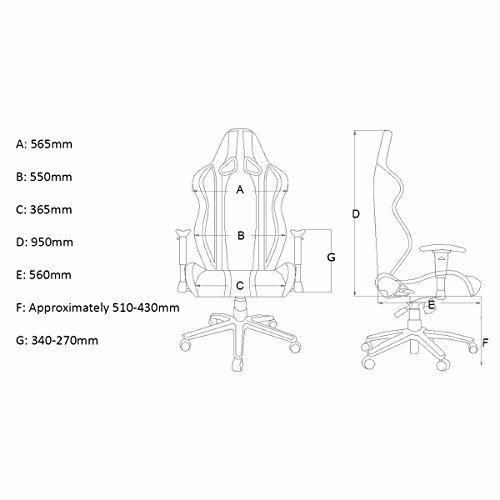 European brand AK Racing is a manufacturer of top quality chairs for gaming. They are highly influenced by the electronic sports craze sweeping the nation, which is the reason for the sleek, active design of their chairs. They reflect a commitment to quality and detail with every chair that AK Racing designs. 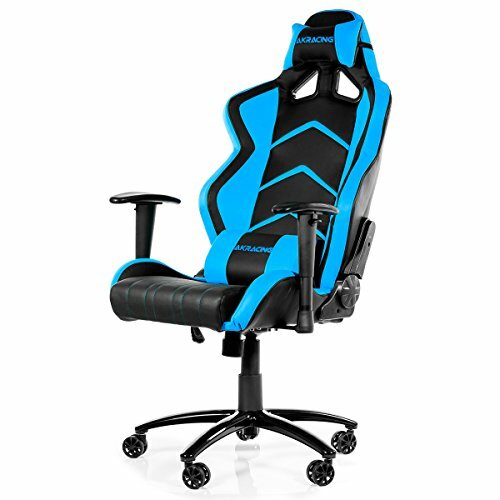 This review will go over the AKRacing Player gaming chair and how it stacks up against other great seating options created especially for the needs of the gamer. The chair comes in a pretty massive box, which is rather heavy to lug around. It weighs about 30 kilos. The box contains everything that you need to put together your AK Racing Player chair, including the parts and tools, as well as a polishing cloth that will keep your chair looking brand new. One of the things that I noticed and appreciated was that the company had taken the time to add an extra step on their end- they lightly screwed the majority of the screws into the holes where they belonged. This also made the setup easier, since there are different size screws included. It took about 25 minutes for me to set up this chair and I suspect that even someone who hasn’t put together many gaming chairs could put it together in 30 minutes or less. Now that the chair was together, I was ready to sit down. I had a rather pleasant seating experience the first time around. In the next sections, you will find out what I liked and disliked in each of the category and finally, whether the chair is worth its cost. I used the chair for about a week, average 4-5 hours per day with 2 days that I sat in the chair for 8 hours or longer. Once I had the chair assembled, I took a step back and looked at my finished work. 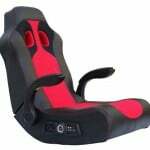 The Player gaming chair sticks close to the racing style. It is sleek and even has harness cut-outs near the neck area, like you would see on a race car seat. Every detail is precise and goes with the sleek style, down to the tight, exceptional stitching that looks both neat and durable. The particular model that I chose is the black chair with blue accents. You can also buy the chair in black with accents in the colours of white, blue, green, red, and pink. The pink chair is a nice touch, especially since it’s a colour often overlooked by companies who forget about the female gamer. When you feel the heaviness of the box, it would only make sense that the parts inside are durable. The AK Racing Player chair has a steel frame that is not as lightweight as aluminium, but that stands up better in the long run. The steel makes the chair heavy, but it does have smooth, hard plastic wheels that allow you to wheel it around the house pretty easily (and quietly, which is great when you find yourself up late to meet a deadline or you want to indulge in an all-night gaming session. The wheel also will not damage the wheels in your home. You will not be able to see the steel frame that makes up the body of the chair. However, you can see the design on the AK Racing website, which shows several supportive steel bars that are very durable. Do not worry about feeling the steel bars though- the combination of thick padding and sturdy polyurethane upholstery provide plenty of comfort. The body/padding of the chair is made and shaped of cold foam. This provides plenty of softness as you sit, without giving way too much and taking away from the back support. This polyurethane upholstery is attached with sturdy looking copper rings. This makes it very unlikely that it will come unattached, which further adds to the durability of the chair. This chair has all of the basic features you could need for comfort, support, and a good gaming experience. 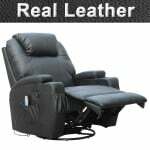 The backrest is adjustable, being able to sit up straight at 90 degrees or recline back flat, to a full 180 degrees. I find this incredibly useful for converting the chair from a work chair to an entertainment chair. I can keep it straight in the morning to drink coffee and answer emails and then recline at night as I watch a movie or play a video game. The reclining function also locks into place, so you do not have to worry about your chair rocking back and forth. The gaming chair also lets you adjust the height in all areas. This includes the backrest, the armrests, and the chair as a whole. The major lift system of the chair is a Class 4 gas lift cylinder that raises and lowers the chair, as well as locks it securely into place. You also do not have to worry about this part of the chair breaking, since it is rated to 159 kilogrammes. A cool feature of this chair that you do not get with every chair is the included lumbar pillow and neck pillow. These can be attached and detached from the chair within seconds to add to customizable support. Finally, the AKRacing Player gaming chair rocks back and forth by 12 degrees. You do not get as much of a rocking function as some other chairs offer, especially rocker gaming chairs. Fortunately, you can adjust the angle of the backrest as well to lean back more. Overall, the features of this chair are nice. 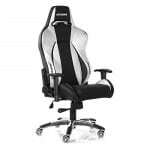 The addition of the lumbar and neck pillows seem like extras and the rest work to meet basic needs of a gaming chair. It is nice to see a gaming chair that is not incredibly elaborate (or expensive) but that still is obviously a gaming chair. AK Racing believes that an ergonomic design is a must for gamers. Statistics show that gamers, even those who only spend a few hours in the chair per night have a high rate of back pain and back problems. 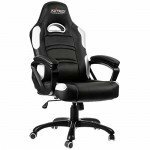 As it says on the AK Racing website, a good gaming chair should be an extension of the spine. The difference in posture that I felt in myself proves their commitment to this point. 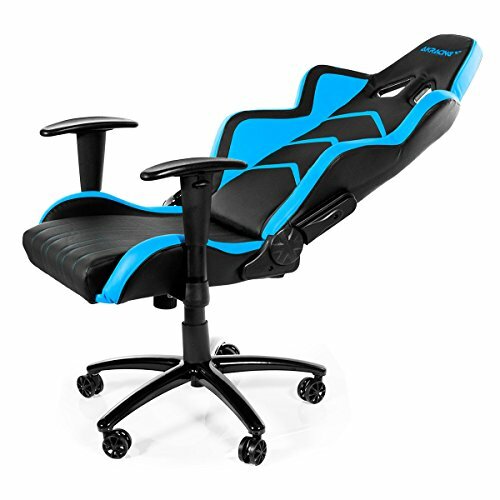 This gaming chair has a wide enough seat to accommodate most people and it fits well under a standard desk, which is a must for me. You can also adjust the height of all the different elements of the chair as well, which means you can make it comfortable for you regardless of your body type. Another factor that adds to the overall comfort of the chair is the pillows for lumbar and neck support. This allows you to decide if you want extra support per sitting session. These also fasten on securely, so you don’t have to worry about the pillows sliding around. Finally, the cold foam material is pleasant to sit on because it gives way to add comfort, but not so much that you lose the back support you critically need as a gamer. 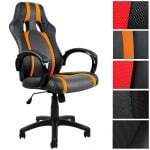 The upholstery is also nice to sit on and it is breathable enough that you will not sweat, even during intense gaming sessions that are hours long. Before you buy this chair, first consider what you will be doing with it. This chair is rather heavy and it does require assembly, so it is not necessarily the best choice if you need a chair that can go more places than just the different rooms of your home. You cannot take it back and forth from work or over to your friend’s house for a gaming session. So, one question that may be on your mind and another consideration that you should make (especially if this chair sounds as great as it is), is what cost this chair comes at. At the current time of the review, this chair is less than £300. This is a little more than some chairs in this area, but in my opinion, the few extra pounds was worth it. Comfort? Got it. Support? Got it. All of the features that you need without unnecessary extras? Got it. 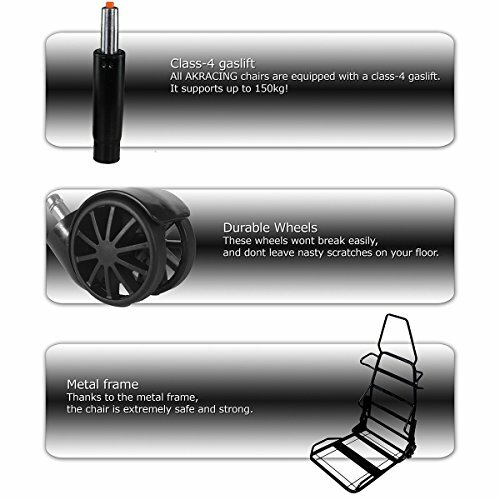 The AKRacing Player gaming chair meets all of these categories and excels. It seems that this chair of their line does meet everything that you would expect from a quality gaming Chair Company, down to the last stitch. The durability of this gaming chair means that it will likely become a fixture in your home for years to come. I expect it to hold up well, especially with the durable construction of the frame, attention to detail in the stitching, and quality of the various components of the chair. Still, only time will tell if I like this chair as much as I do now. Something that you must remember as you choose your gaming chair is that it is completely up to you. 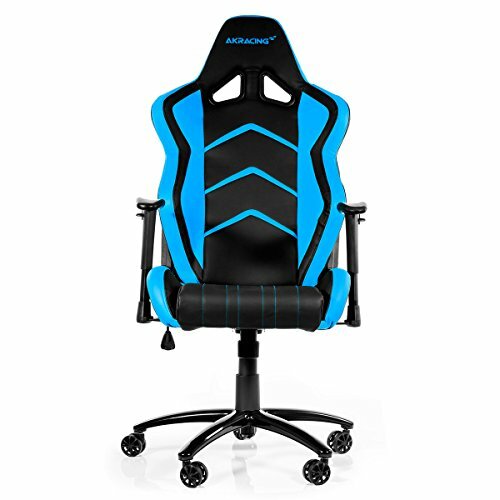 No amount of good reviews for a chair mean that it will meet your specific needs, especially if you need extra features like a cup holder for super long gaming sessions or you want a chair with electronic features like an audio system. Decide on what features are necessary for you and then make decisions about what chair you will buy. It may be best to compile a list of some of the best chairs within your budget range that meet your needs and then compare the gaming chairs side by side.